Thailand’s street food is world-renowned, and anyone who has visited the capital will tell you it is difficult to walk through the streets of Bangkok without dodging an endless collection of food stalls. From curries to salads to stir-fries, Thais love to eat – and some of the best and most authentic flavours are found on the humble pavements. Cooks specialising in just a handful of dishes work to memorised recipes passed down through generations. But with so much choice, what should you eat? To get you started, here’s a collection of just some of our long list of Thai street food favourites. Quite simply the staple that Thais plump for when they’re all out of inspiration for what to eat, this spicy and salty stir-fry can quickly become addictive. Chicken, pork, beef or seafood is flash-fried with pounded chillies, garlic and plenty of Thai holy basil in a mix of oyster and fish sauces. Expect green beans or bamboo shoots to make an appearance too; the whole lot is served on top of a bed of steamed rice, with an optional (but highly recommended!) fried egg. You’ll find pad krapao and other similar dishes at made-to-order stir-fry stalls all over Bangkok; just keep an eye out for a glass cabinet of fresh vegetables, and a couple of smoking woks. At most stalls a plate of pad krapao will set you back 30-40 baht or, for a higher end version, head to the famously pricey Jay Fai stir-fry restaurant on Mahachai Road, in Bangkok’s old town district, for a seafood pad krapao that will cost at least 400 baht. Another ubiquitous Thai dish and often known simply as ‘chicken rice’, khao man gai has its origins inthe Hainan region of China but today is also widely found in neighbouring Singapore and Malaysia too. What looks like a simple dish – pieces of steamed chicken on a bed of rice – is actually the result of a long process, which involves cooking down whole chicken carcasses to gently infuse the rice with the flavours of the stock. In danger of being labelled bland in comparison to other fiery Thai dishes, khao man gai is served up with a piquant chilli dip and a bowl of hearty chicken broth. Fried chicken fans will be pleased to hear there is also a variation for them – khao man gai tod – while other similar dishes include khao moo daeng, red barbecued pork on rice with a hard-boiled egg and a sweet gravy-like sauce, and khao na bped, roasted duck on rice. A plate of khao man gai ranges anywhere from 30 to 50 baht; don’t miss the late-night setup at the end of Silom Soi 2 that catches the post-clubbing crowd. In the daytime, Ko-Ang khao man gai on Phetburi Soi 30, in the Pratunam area, frequently gets the thumbs-up from Thais and expats alike. Hailing from Thailand’s northeastern Isaan region, it is now found all over Thailand, with a particular concentration in Bangkok. Once you know what you’re looking for it is difficult to walk down a street without bumping into a somtum stall. Unripe green papaya is shredded and pounded in a pestle and mortar with the base ingredients of garlic, chillies (lots of them! ), fish sauce and lime juice, and then finished with flavours depending on the variety of the dish you’ve ordered. Authentic northeastern somtum puu pla rah throws in pickled crabs, fermented (read rotten) fish and little else besides green beans and tomatoes, while somtum thai is tempered for the Bangkok (and foreigners) palate – it contains none of the rotten fish and instead opts for tiny dried prawns, peanuts and palm sugar to give the end dish a much sweeter taste. 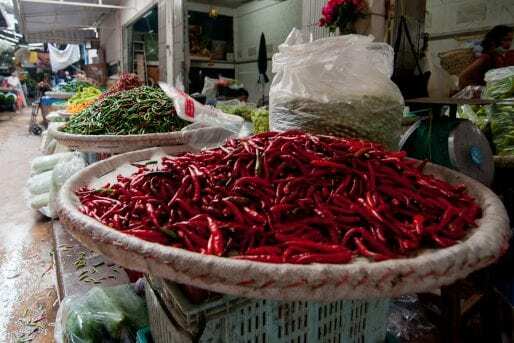 Choose how many chilies you want to vary the spiciness! Other varieties include somtum hoy dong, made with pickled cockles, somtum puu maa – with raw, marinated blue crab – and somtum sua, a take on the Isaan original that adds kanom jeen rice noodles to the mix. A plate of somtum will cost you between 30 and 60 baht depending on the variety, and is best enjoyed with sticky rice and other Isaan dishes like grilled chicken, spicy laab salads and the dill-heavy gaeng om soup. A bunch of street food stalls beneath Ratchathewi BTS station is a popular and accessible way to enjoy somtum, but for some of the best head to a stall on the corner of Udomsuk Soi 19 (Sukhumvit Soi 103), a short walk from the far eastern end of the BTS Sukhumvit line. If there’s a guilty comfort snack for Bangkokians, it’s moo ping. These tasty skewers of grilled pork are fatty, succulent and oh-so-good. After marinating the skewered pork in coconut milk and other secret ingredient mixes, stallholders brush moo ping with various preparations that can change the end taste – popular are fresh cow’s milk, which gives a sticky, toffee-like flavour, and coconut milk. Whatever they are coated with, moo ping are at their best when grilled over old-fashioned charcoal rather than an electric or gas grill, and preferably when eaten right away while still warm. Enjoy them with sticky rice on the go – stalls right across Bangkok (and beyond) sell moo ping for 5-10 baht per skewer, while sticky rice usually goes for 5 baht per bag. Though in our opinion there is better to be had (but often in the most unexpected of locations), Bangkokians regularly vote with their feet for a man who sells moo ping nightly to the clubber crowds at the top of Soi Convent, almost opposite Silom Soi 4. Could it be the booze that makes them taste so good? What would a list of Thai street food be without the popular image of a Thai curry? Be it green, red, massuman or penang, or any of the other multitude available, Bangkok’s plethora of curry stalls serve up spicy concoctions that are as good at – or likely better – than anything you’ll find in a high-class Thai restaurant. You can easily identify these stalls, since everything is already prepared and in trays so you can just point at what you want to eat. Rice and curry stalls usually also have a number of stir-fries on offer, meaning you can mix and match – if you want some of that mussel red curry with a ladle-full of those stir-fried mixed vegetables, that’s what you can have. Expect to pay anywhere between 25 and 50 baht for a plate of rice and servings of a couple of dishes, including at Khao Gaeng Jake Puey, a popular curry stall on the corner of Soi Mongkon in the Chinatown district of Yaowarat. The irony of eating boiling noodle soups in hot, humid weather is often lost in Thailand, you should led it slip over you for the sake of tucking into the type of dish that is the midday sustenance of a good chunk of the population. There are about as many variations on the basic dish as there are street food vendors in Bangkok, but soup bases tend to include the clear nam sai, hot and sour tom yum and pig’s blood infused nam tok. There is a variety of thin and wide rice and wheat noodles to select from – these are usually on display in a glass cabinet at the stall, so you can point and choose. Then pick your poison on the meat front – chicken, pork, beef and duck are the most common – and throw in plenty of dried chillies, sugar, fish sauce and vinegar from the table to season the dish yourself. Noodle dishes are some of the only ones that Thais use chopsticks to eat – though after a few drinks, when noodle soups are a great light dish to soak up the booze without overdoing it, you might struggle to use them. The area around Victory Monument BTS station is popular for noodle soups, and here and elsewhere you can expect to pay 30-50 baht for a regular bowl. Chinese kale (also known as Chinese broccoli) makes an appearance in this equally popular mainstay of the Thai stir-fry stall, where it’s paired up with pieces of crispy barbecued pork belly to create a rich and satisfying – but also pretty healthy – dish. The kale cuts through the rich fattiness of the pork, as does the chilli, though this doesn’t need to be an especially spicy dish. Like many Thai stir-fry dishes, kana moo grob is frequently topped with a fried egg or omelette. Yet another stir-fry mainstay is meat – whether it’s pork, chicken, beef, seafood, or some other specimen – stir-fried in spicy red curry paste, and served over rice. Like so many stir-fry dishes, how it’s made varies from restaurant to restaurant, but in our opinion this is one that’s best kept simple. All those extra vegetables that some places throw in (baby sweetcorn, we’re looking at you!) just detract from the overall flavour. For us, pad prik gaeng should be little more than your choice of meat in curry paste, a few green beans, and a couple of shredded kaffir lime leaves. Topped with a fried egg or omelette, this is bliss. This Chinese-influenced dish combines yellow egg noodles – most commonly in a meat-based broth, though we enjoy ours dry, perhaps with some soup on the side – with pieces of marinated and barbecued red pork, succulent minced pork dumplings, and vegetables like spring onions. As ever, preparation of ba mee varies from stall to stall and restaurant to restaurant, and it’s common to add luk chin meatballs into the mix, too. Like other noodle dishes, you season this one at the table – along with the usual condiments, you’ll often also find a pot of crushed peanuts to go with this one; they really add some welcome crunch. This is another Chinese-influenced dish that’s sold at standalone stalls, at those that also tout ba mee noodles, and by khao man gai chicken rice vendors. Steamed rice is topped with slices of barbecued red pork and sweet gun chiang Chinese-style sausage, a rich and sweet gravy-like sauce, and half a boiled egg. Top it yourself with sprigs of raw spring onion to cut through the fatty flavours, plus plenty of chilli-infused soy sauce, and enjoy it with the bowl of clear broth that’s almost always served alongside. Gai tod is equally what it says on the tin – fried chicken. And while we’re not going to pretend this is in any way Thailand’s healthiest dish, sometimes it’s just what you’re after. Best when it’s freshly fried and perfectly crispy on the outside, enjoy your gai tod with plenty of sticky rice, perhaps some chilli-based dipping sauce, and maybe a side of fiery somtum papaya salad (see above) to cut through the grease. Like its fried cousin, grilled chicken is a dish that’s commonly enjoyed alongside papaya salad – once again, the spicy and sour flavours of somtum do a fabulous job of cutting through the delicious greasiness of the chicken. Gai yaang is at its best when it’s given a good marinating, before being cooked on an open barbecue until it’s crispy on the outside but still tender and juicy under the skin. Some of the best grilled chicken we’ve had is at a nameless stall on Sukhumvit Soi 101/1 in eastern Bangkok, where it’s served with a tamarind-based chilli dipping sauce that’s at once sweet, spicy and utterly addictive. What can we say about pad thai that hasn’t been said already? Alongside green curry, it’s probably Thailand’s most famous meal (though we would reserve the title of ‘national dish’ for somtum papaya salad), and it’s tucked into by millions of visitors every year, as well as having a healthy following among Thais and foreign residents. In its most puritan form, it’s a fry-up of toothsome Chanthaburi rice noodles, fresh prawns (not chicken, beef or pork as is popular at many overseas Thai restaurants, and also commonly found in touristy areas of Bangkok), eggs, tofu, beansprouts and preserved radish. Squeeze some lime juice on top, and add dried chilli, sugar, vinegar and fish sauce to your taste, and you’ve got a pretty impressive classic. Pad thai is a dish with a rich history, too – take a look at this post for the scoop on its post-WW2 heritage. And join our Bangkok Night Lights tuk tuk tour for the chance to take in one of Bangkok’s most renowned pad thai restaurants. Alongside fried spring rolls, these easy street eats are a favourite among visitors as well as Thais, and frequently make it onto the menus of Thai restaurants overseas, too. Minced white fish is combined with chopped green beans, kaffir lime leaves, and a healthy dollop of red curry paste, then shaped by hand into discs and fried into addictive snacks that are delicious dipped in sweet chilli sauce and accompanied by sticky rice. Who could go wrong with a simple omelette? Thai omelettes throw in everything from minced pork and onions to chilli for extra bite – and while, you’ll find this staple available at run-of-the-mill stir-fry stalls across Bangkok and Thailand, dedicated omelette-only street kitchens are also a common sight in areas popular with hungry office workers over lunchtime. Served over steamed rice and often with a side of Sriracha-style chilli sauce, they’re a cheap, filling and easily portable option for lunch at your desk – and a whole lot more exciting than a bland sandwich! Look, luk chin won’t win any awards in the health department – there’s little doubt about that. Nor, it has to be said, are they likely to pick up accolades for show-stopping flavour – but none of this seems to be a barrier to the popularity of these utterly artificial-looking skewers of meat and seafood among Thais. The stuff on the sticks ranges from chicken, beef, pork and fish balls, to hot-dog-style sausages, and they’re either steamed or deep-fried, before being loaded into take-away bags and drowned in sweet chilli sauce. Luk chin are an inexpensive and convenient option for sustenance to take onto buses and trains in preparation for a long ride ahead. We’ve got a soft spot for southern Thai satay, and it’s not a dish that’s difficult to find in Bangkok. But while those visiting Thailand might be accustomed to the chicken variety being the most prevalent on Thai restaurant menus overseas (owing to satay’s origin in predominantly Muslim countries like Malaysia and Indonesia), in Bangkok and elsewhere around the country you’re much more likely to come across pork satay. That said, some of the best satay we’ve had is at old-town joint Areesa Rote Dee, where the only option is beef – we find it adds extra flavour and bite, and that’s always welcome. Whatever type you chow down on, you can expect richness from the marinade of red curry paste, coconut milk and peanuts. The meat skewers are then grilled and served with a sweet and sour side of ajaat, a salad of cucumber, onions and chilli pickled in vinegar that does a wonderful job of cutting through the fatty meat. It’s also common for satay to be accompanied by pieces of bread to mop up all those lovely juices. Frequently served up at pad thai stalls alongside the famous noodle dish, hoy tod is another of our favourites – and, if we’re being perfectly honest, it’s often our choice of the two. This sinfully greasy but crispy and addictive dish combines handfuls of fresh mussels (or occasionally oysters) and beansprouts in a concoction that’s somewhere between an omelette and a pancake. Smear it with plenty of Sriracha chilli sauce and you’ve got a winner that you’ll choose over pad thai time and again. If you want to discover some of these dishes, contact us about to arrange a custom tour adapted to your interests. What are your favourite Thai street foods? Let us know in the comments!